It has been quite awhile since I have posted on my blog, basically I have been lost. 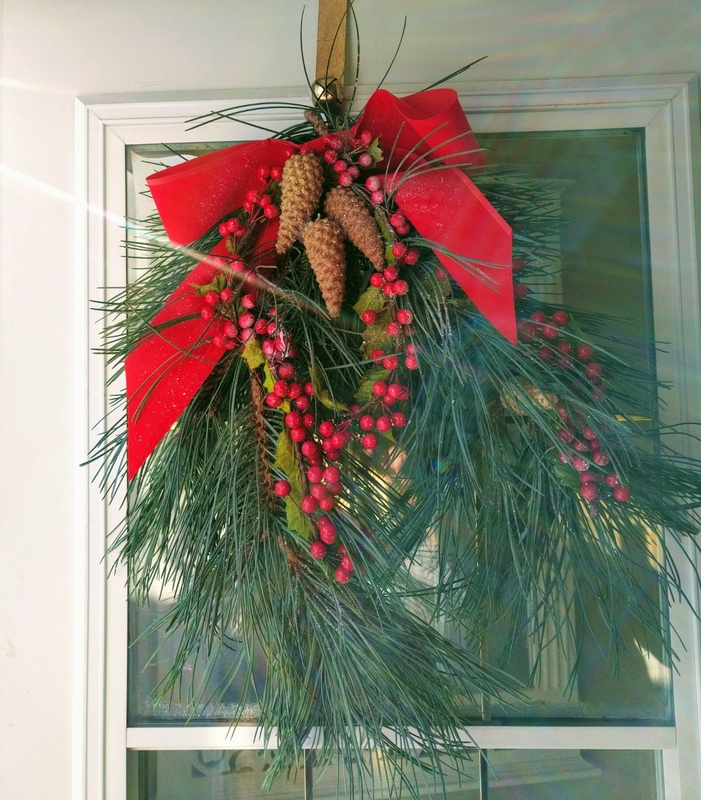 I barely made it through December due to migraines, which just seemed to blend each day together. 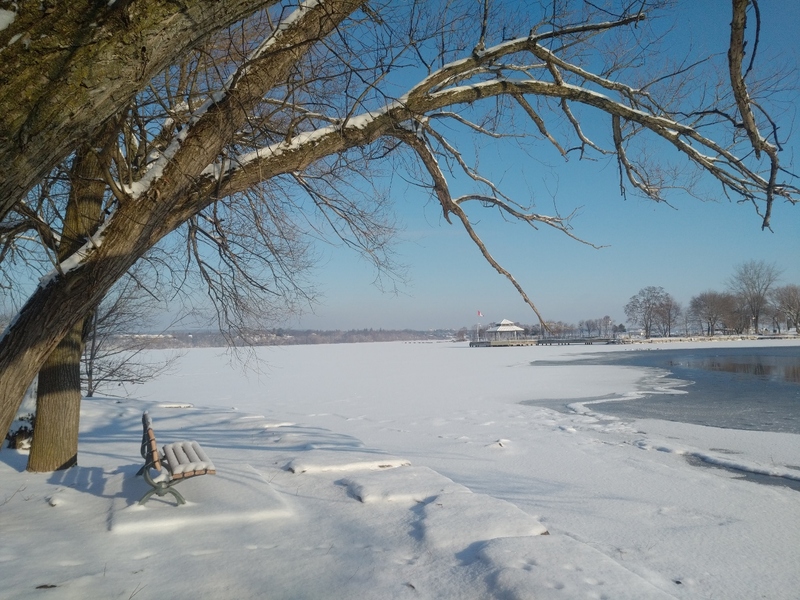 My activity on social media came to a standstill, very little Twittering, Instagram, Facebook, and blogging, well no activity there. The daily news was depressing, so I even ignored it. Did I find it difficult cutting back? Not at all. 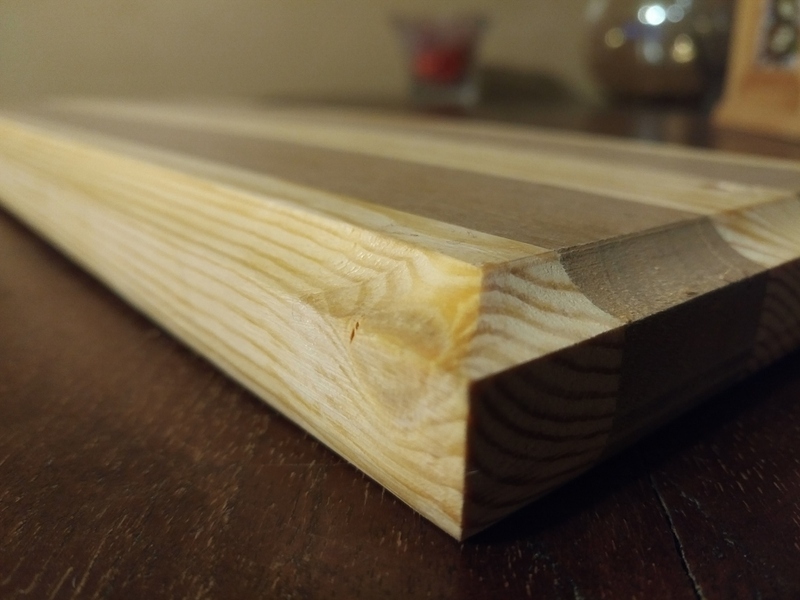 During this time I have been busy with life, enjoying woodworking immensely, and yoga. 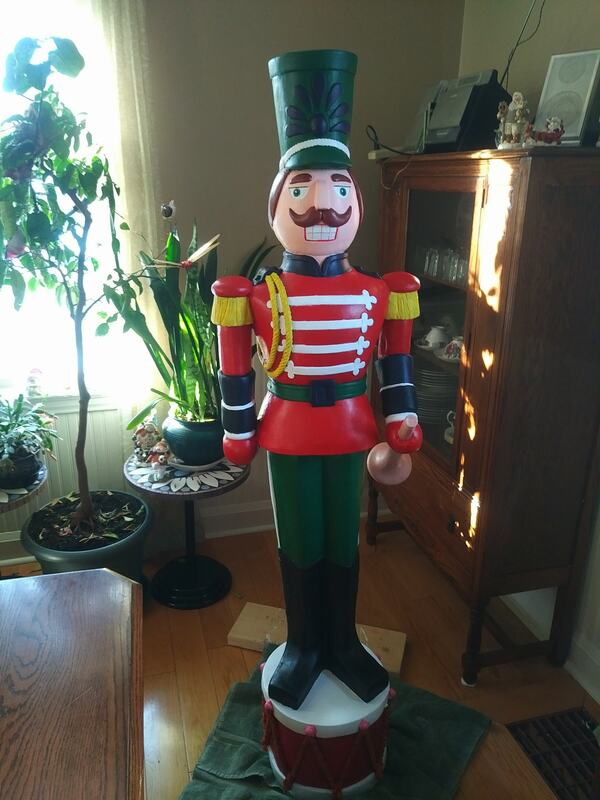 In December, I finished painting the life-size Nutcracker our eldest daughter gave me. 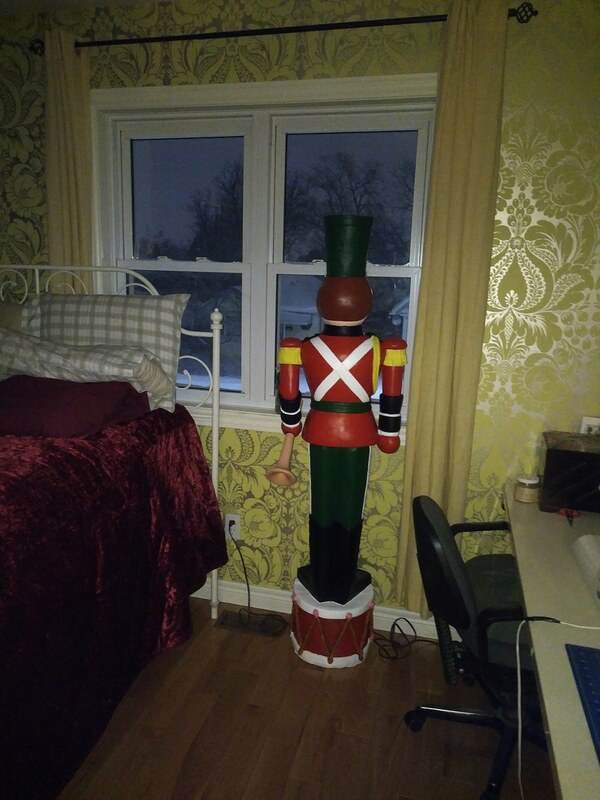 It was positioned in the front window, then after Christmas was moved upstairs to the bedroom window. 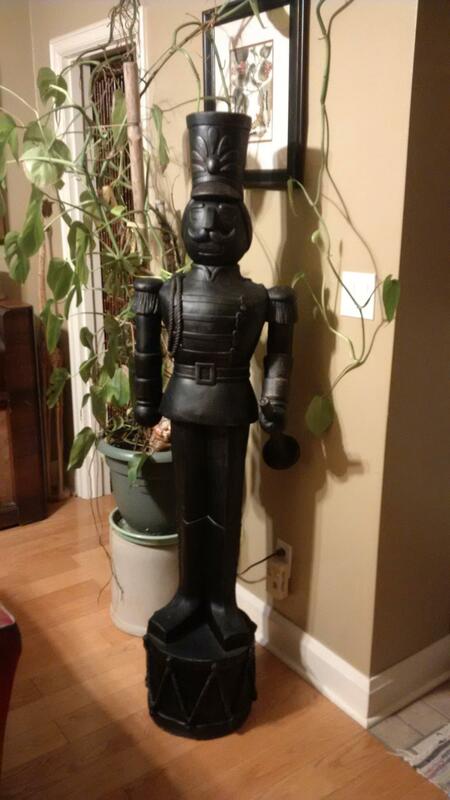 I had really wanted to have it grace the front porch, but I was vetoed by my husband, and son. I think manly because I had wanted them to bolt the base to the porch. Oh well, it look fabulous in the window. 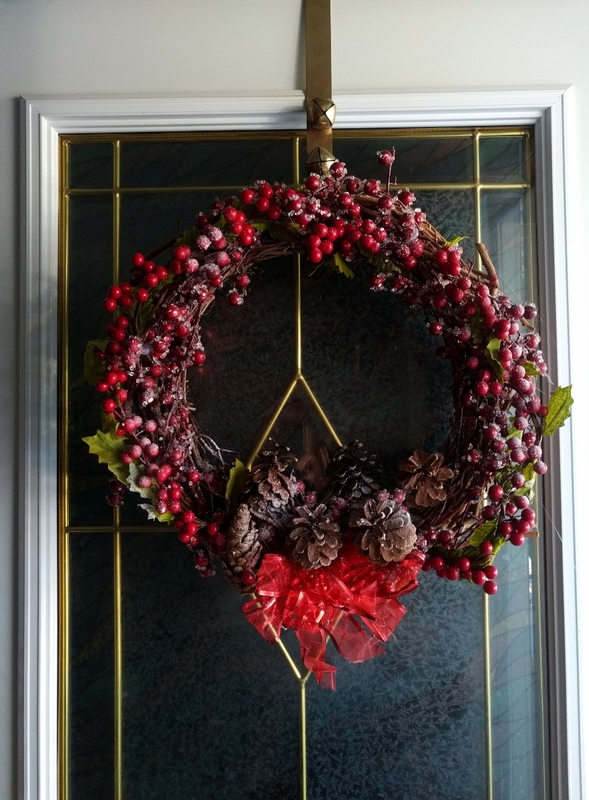 For Christmas I also made two new wreaths for the front and back doors. 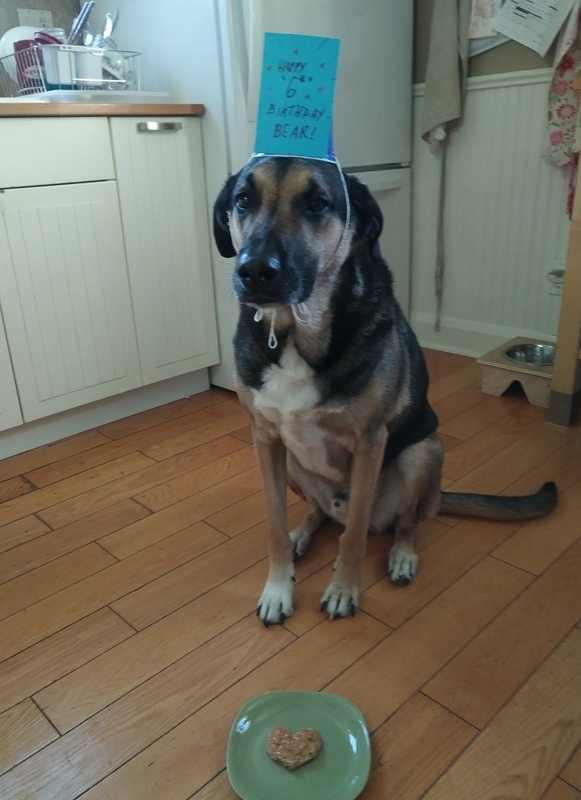 In January we celebrated Bear’s 6th birthday; this means a hat, and a peanut butter sandwich. Woodworking has also kept me quite busy. 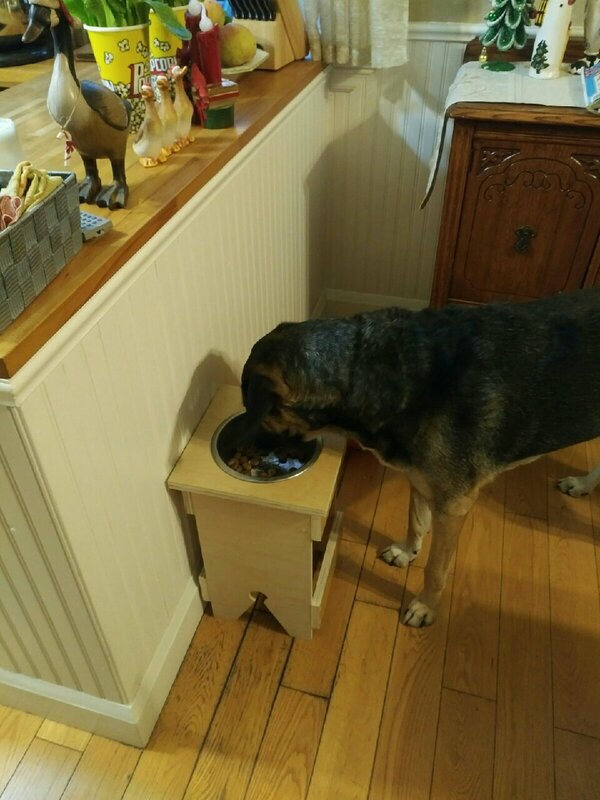 During the past few months, I’ve completed the construction of a bedside table for my husband, and two new dog dish stands for Bear and Cocoa. 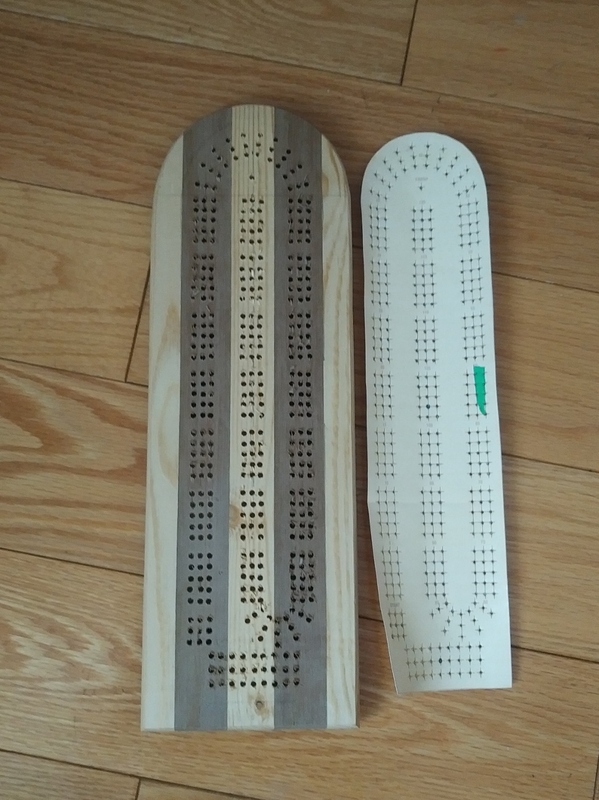 My latest project is a cribbage board for middle child. She had asked me to make one for her, so that she can teach her boyfriend to play. 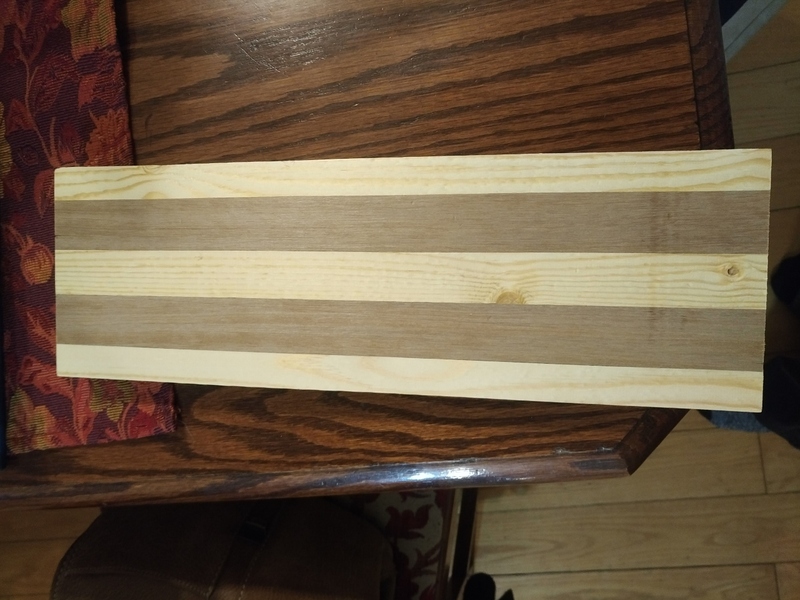 For the board I cut, planed, and joined together walnut and pine (sadly I did not enough walnut for an entire board). 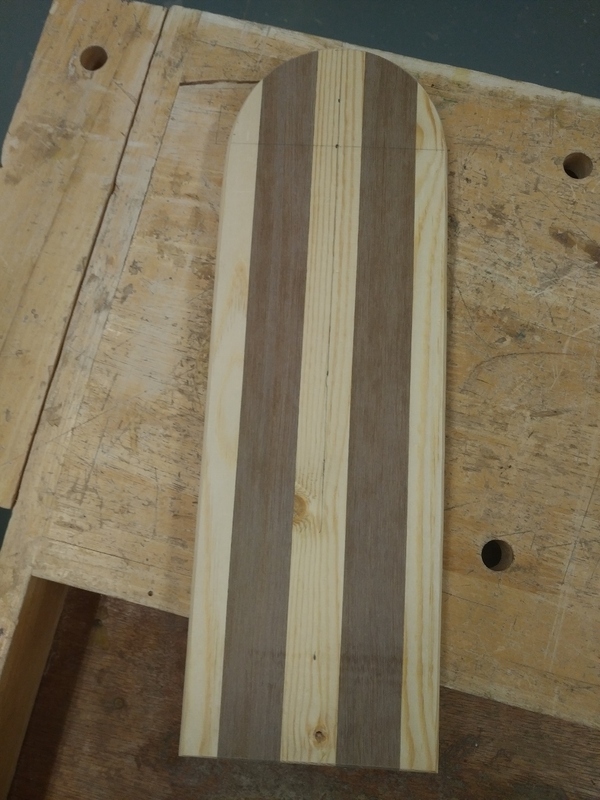 Next, I used the band-saw to make the top curve, then I routered the top edge, and bottom. I printed out a template for the holes. Using an awl, I punched a hole so the drill would be able to grab, and drill down. Two hundred holes were quite easy to do, it was just very time-consuming, but with persistence I was able to drill all 200 in two and a half hours. 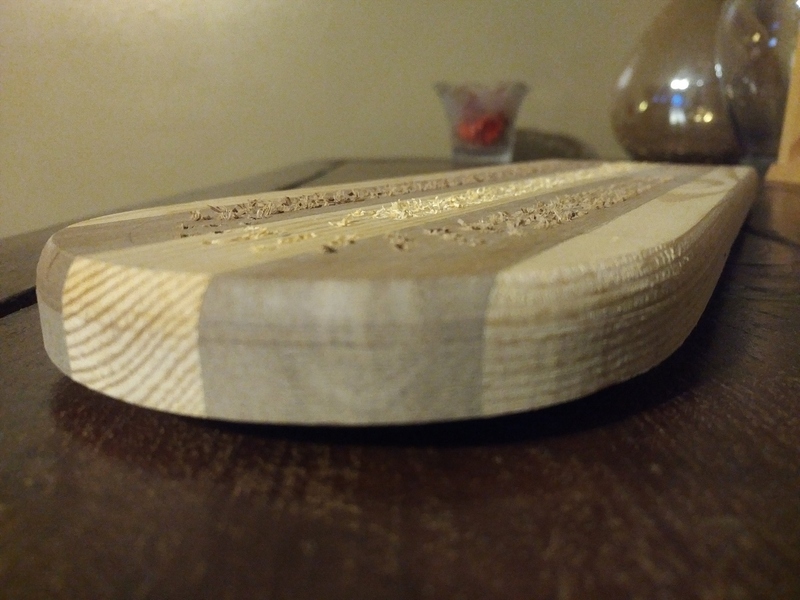 Since I did not create a slot on the bottom of the cribbage board for the pegs, I am constructing a base for it to sit on. The base will have a place for the cards, and the pegs. 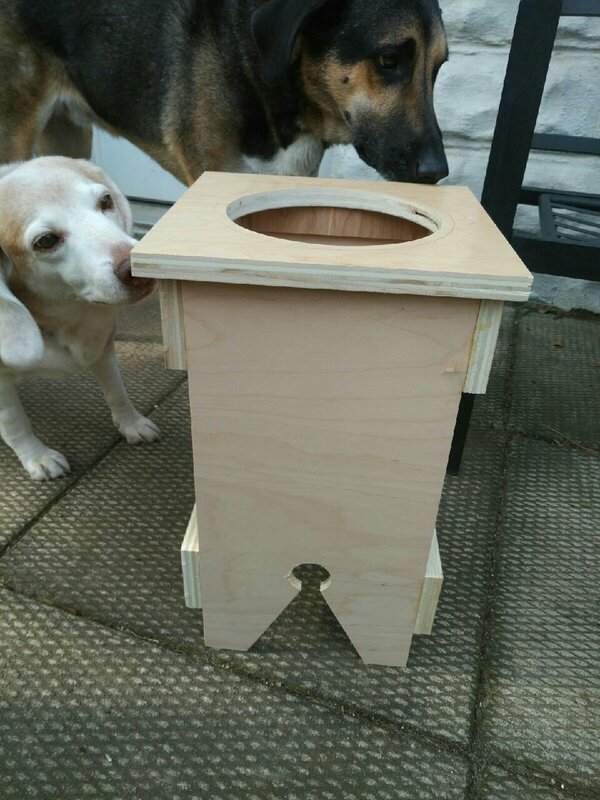 It will be attached to the top with magnets and a wooden dowel, so it can swivel. I should have this completed in my next class, then it is just sanding, any touch-ups needed, and finally staining. 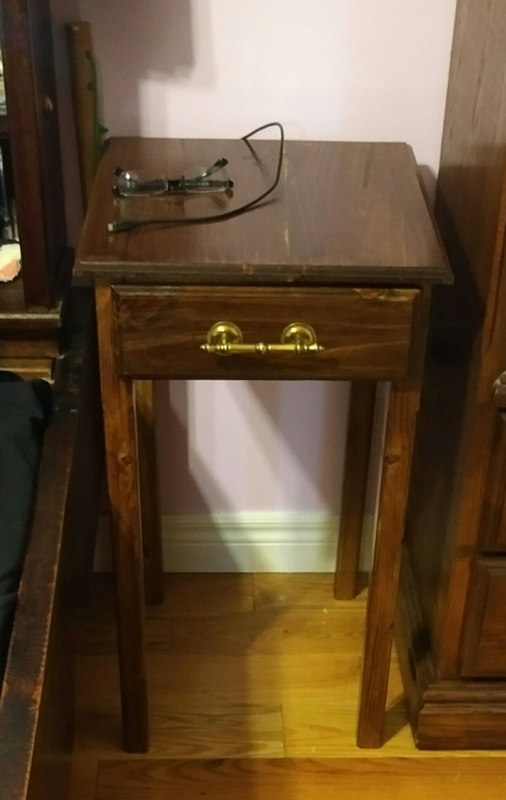 This entry was posted in Band saw, Bayfront Park, Bedside table, Birthday, Birthdays, Blog, Blog post, Blogging, Blogs, Christmas, Christmas Wreath, Cribbage board, diy, DIY, Do It Yourself, Dog, Dog dish, Dog dish, dogs, Facebook, Instagram, Joiner, Planer, Router, Social Media, Table saw, Tools, Twitter, Woodworking, Yoga and tagged Band Saw, Bedside Table, Birthday, Blogging, Board games, Christmas, Crafting, Crafts, Cribbage, Cribbage board, DIY, Do it Yourself, Dog, Dog-dish, Dog-dish stand, dogs, Drill, Drillpress, Facebook, Games, Instagram, Life-size Nutcracker, Nutcracker, Router, Table, Twitter, Twittering, Woodworking, Wreath, Wreaths, Yoga on February 16, 2018 by AlwaysARedhead.